Luci receives 2.5 STARS and is NOT RECOMMENDED. The fact that certain electronic cigarette manufacturers continue to produce 3-piece designs is both a disappointment and a source of frustration for the editors of this site. An increasing number of electronic cigarette manufacturers are changing to two-piece designs and their three-piece counterparts are probably going to become obsolescent very soon. This bias of ours was tested when we noticed that Luci e-cigarettes have received numerous good reviews on websites and in online videos. Their e-cigs are all based on three-piece designs. We felt some obligation to put our prejudices to the test and give you a review of this brand. The Luci website was very user-friendly. The design is simple, clean and modern. It has quality graphics and clear navigational procedures. 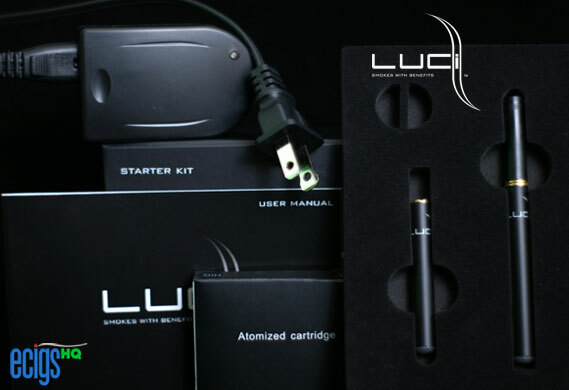 Their Getting Started page explains the details surrounding design, use and maintenance of Luci electronic cigarettes. The Customer Service page lists a toll-free phone number for information regarding sales, products and warranties. It also contains a link to an alternate e-mail form with which you can contact the support team. This page also includes a link to their press kit. Eight days after we ordered Luci’s Basic Starter Kit, we received it in the mail. Excited and curious, we immediately opened the package and took out all the components of the kit from their boxes. We took the cellophane wrapping off one of the black cartridges designated as Full Flavor and inserted an atomizer. To this apparatus we attached one of the black batteries. After this, we took a few short drags on the e-cig and exhaled. We were sadly disappointed by the results. The vapor volume was less than mediocre. One of our judges described the vapor plume as poor. Another went so far as to call it pathetic. To make matters worse, dragging on the Luci e-cig took a great deal of effort. The flavor was an additional item on our list of disappointments. It was mild with strong vanilla undertones but it lacked true tobacco flavor. There was no throat-hit whatsoever. The one thing we appreciated was the lack of those annoying crackling and popping sounds that so many lesser designs of e-cigarettes make. There was one indisputably positive outcome of our initial test. Everyone thought that the all-black Luci e-cigarette looked very good in our hands. This product was unusually distinct in another fashion. Excepting the Blu Cigs, this was the smallest cigarette-style battery we have ever tested. The Luci cigarette measures just 2.625 inches in length and has a diameter of just one-third of an inch. With these dimensions, it is obvious that the manufacturers were trying for the appearance of a regular tobacco cigarette. It was more lightweight than the average e-cigarette but the balance left something to be desired. We finished our first test of the product and, as usual, plugged the battery into the AC wall charger so that we could make a second test the next day. We switched cartridges for the second session of testing. This led to an unforeseen disappointment. When we tugged the atomizer from the used cartridge, we found that the wadding which holds flavored nicotine had stuck to the atomizer. This wadding was soaked. We removed it carefully and attached a new cartridge. The second day’s tests had equally disappointing results. Even on a full charge the Luci electronic cigarette performed inadequately. Maintaining a single-pack-per-day habit with Luci products would cost exactly $831.61 over the course of a year. This would include the initial cost associated with the Luci Express Starter Kit. If you compare this to the cost of maintain the same habit with regular tobacco cigarettes, which cost about $6 per pack, you would pay $2,190 in a single year. Luci e-cigarettes could save you nearly $1,360 every year. We give Luci just 2.5 STARS and do NOT RECOMMEND it. 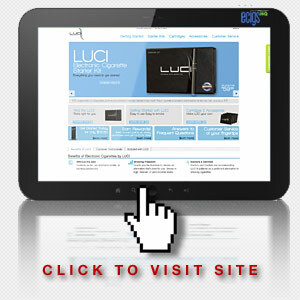 Click on the Official Luci Website link found below. When you reach checkout, enter 4d64ef5b314ee in the box marked Coupon Code and receive a $5 discount on any starter kit.